The toolkit is designed to offer resources to program managers and case managers who are working in rapid re-housing (RRH) and who may need support and assistance on certain aspects of the program. We will collect resources related to the following topics. Where possible, these will be CoC, region, or state specific. However, some, from necessity will be nationwide examples of best practice. Rapid re-housing is an intervention designed to help individuals and families quickly exit homelessness and return to permanent housing. Rapid re-housing assistance is offered without preconditions — like employment, income, absence of criminal record, or sobriety — and the resources and services provided are tailored to the unique needs of the household. NAEH Video – What is Rapid Re-housing? The Department of Housing and Urban Development (HUD) defines homelessness, into four specific categories. Any individual or household who is to be rapidly rehoused must meet certain eligibility criteria, the first being that they fulfil HUD’s homeless definition criteria. The links below give more information and explanation of HUD’s definition of homelessness, and how to determine eligibility. 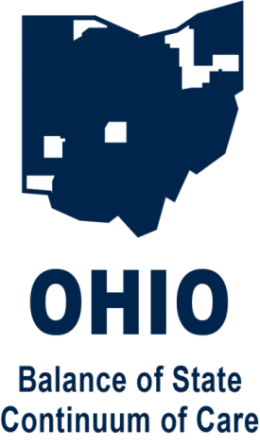 It is important to review CoC specific documentation before reviewing nationwide or regional resources, as the Ohio Balance of State CoC may have added additional criteria to further restrict eligibility. Page 5 of the BoSCoC Program Standards. Homelessness is first and foremost a housing crisis and can be addressed through the provision of safe and affordable housing. All people experiencing homelessness, regardless of their housing history and duration of homelessness, can achieve housing stability in permanent housing. Some may need very little support for a brief period of time, while others may need more intensive and long-term supports. Many people experience improvements in quality of life, in the areas of health, mental health, substance use, and employment, as a result of achieving housing. People experiencing homelessness have the right to self-determination and should be treated with dignity and respect. The exact configuration of housing and services depends upon the needs and preferences of the population. Harm reduction is an approach for substance use treatment that involves a set of practical techniques that are openly negotiated with clients around what is most likely to be achieved. The focus is on reducing the negative consequences and risky behaviors of substance use; it neither condones nor condemns any behavior. By incorporating strategies on a continuum from safer drug use, to managed substance use, up to abstinence, harm reduction practice helps clients affect positive changes in their lives. Building Changes describes Progressive Engagement as an approach to support families to quickly self-resolve their homelessness by tailoring services to offer just what is needed. In a progressive engagement (PE) approach, a family seeking housing receives a small amount of assistance, tailored to their most critical need, with a keen focus on quickly resolving the housing crisis. The family keeps in regular contact with their provider, mutually monitoring whether the initial support was successful. If needed, the provider can adjust the amount and intensity of tailored service until the family has obtained permanent housing. With PE, the family and provider work together to get the family into housing first, and then may identify additional goals. The PE approach can be broadly applied within your homeless housing system, complementing strategies such as Diversion and Rapid Re-Housing. PE can help improve efficiency across the entire system and community by matching the most intensive and expensive resources with the families who demonstrate they need them most. Motivational Interviewing includes a set of practices designed to initiate and build collaborative conversations between people. Detailed by Stephen Rollnick and William Miller in 1991, MI practices can be used in almost any setting with any population and always focus on the idea of change, while drawing upon what a person already knows, what one has experienced and where they want to be. Motivational Interviewing practices utilize active listening, participant engagement, recognition of barriers and trust that honors a person’s autonomy. MI conversations are built to be non-judgmental, non-confrontational and non-adversarial. MI helps people envision a better future and increases their motivation to achieve it, while acknowledging both the barriers and the successes along the way. Successful landlord partnerships are locally driven and involve ongoing engagement. No single approach is the answer – the unique needs and assets of each community must be taken into account. The rent charged for a unit must be reasonable in relation to rents currently being charged for comparable units in the private unassisted market and must not be in excess of rents currently being charged by the owner for comparable unassisted units. In many areas, the easiest way to determine rent reasonableness is to use a housing database search engine that will compare units and rents against one another. Other local resources may also be used to obtain information, such as market surveys, classified ads, and information from real estate agents. When comparing rent reasonableness, the proposed unit must be compared to three other units. FMRs are gross rent estimates. The gross rent for a unit equals the contract rent plus the utility allowance, if the property has a utility allowance. The U.S. Department of Housing and Urban Development (HUD) annually estimates FMRs for 530 metropolitan areas and 2,045 nonmetropolitan county areas. HUD sets FMRs to assure that a sufficient supply of rental housing is available to program participants. By law, HUD is required to publish new FMRs at the start of each federal fiscal year on October 1. RRH funding provides communities with a range of flexible financial tools to prevent homelessness as well as to assist in re‐housing homeless households. Periodically reassessing the preferences, needs, and abilities of households assisted by rapid re-housing is critical, as this allows for the determination of whether the levels of both financial assistance and services need to be either increased or decreased to produce the most successful outcomes. One method of implementing a rapid re-housing program is using a ‘progressive engagement’ approach, wherein households experiencing homelessness are given a basic level of financial and services supports. Ongoing monitoring and periodic reassessment determines if and when the basic level of assistance should be changed. This allows rapid re-housing programs to be flexible and adapt to changing circumstances.